The National Flute Orchestra is a UK-based ensemble, formed in 2008 by Margaret Lowe and Kenneth Bell, with support from the Birmingham Flute Commission. Margaret, a highly respected, local professional flautist and teacher for many years, since 1990 has devoted her professional life to being an ambassador for increasing awareness of the larger sizes of flutes, and their musical possibilities when played in a large, 'orchestral' ensemble - a Flute Orchestra. She is well known both in the Uk, and in flute-playing circles in the USA. In 1995, she set up the former 'Birmingham Flute Commission' in partnership with the Conservatoire, through which new works for this type of ensemble were written. The NFO was founded later, to promote and develop public awareness of this type of music, and also to provide professionally-trained flautists with an opportunity to maintain their high standard of performance. It plays a wide range of music, but still specialises in performing new, contemporary music written for the genre. It showcases the full range of instruments within the flute family (piccolos, concert flutes, alto flutes, bass flutes, contra-alto, contrabass and sub-contrabass flutes), giving the ensemble the same pitch range as a traditional symphony orchestra. All members of the National Flute Orchestra play the standard concert flute and piccolo. Most members also possess at least one of the larger instruments, so that between us, we have, and play, all the instruments except the sub-contra alto. This means the ensemble is a versatile group that can adapt to the needs of any score. 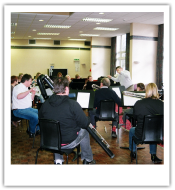 The orchestra is currently conducted by Tony Bridgewater, composer, pianist and former Director of Music at Old Swinford Hospital School. The Flute Choir is an ensemble of flutes with several players playing each of its individual parts, as in a vocal choir. The earliest flute choirs had concert flutes only, divided into four or more parts, with a piccolo sometimes added if one was available. As alto and bass flutes developed into more practical instruments, and became more easily available, they were integrated into the flute choir, and now most flute choirs have at least one of each of these instruments giving a greater range of flexibility and expression. added to the flute choir, give the flute family a wider range approaching that of the string orchestra. These two large instruments are expensive to buy, so that they do not yet appear very frequently. The sub-contra alto and sub-contrabass flutes have been developed even more recently and give the orchestra a slightly greater range of pitch than the string orchestra. They too are expensive instruments, so as yet they appear only rarely, but their presence within the flute orchestra adds greatly to the expressive tonal quality of the ensemble.